The Forest Fody was formally described by Walter Rothschild, a British banker, politician, and zoologist. The collector of the Forest Fody is unknown. Rothschild employed other people to collect birds and animals for him in remote and little-known parts of the world. This would have included the Forest Fody, which was collected in Madagascar on 21 Aug 1891 (date presumably based on a label). However, the name of the collector was not recorded. Two more males from 1891 were also included as types. Rothschild also hired professional scientists to work with him to write up his resulting collections, e.g. Ernst Hartert for birds, from 1892 until his retirement at the age of 70 in 1930. But Rothschild wrote up the species description for the Forest Fody himself in 1912, several years after it had been collected. 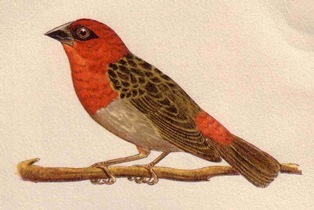 Presumably the specimen had been thought to be a moulting Madagascar Fody at first, as Rothschild named it "omissa", i.e. overlooked. At one point Rothschild's collection included 300000 bird skins, 200000 birds' eggs, as well as thousands of specimens of mammals, reptiles, fishes, butterflies, and beetles. They formed the largest zoological collection ever amassed by a private individual. Rothschild opened his private museum in 1892. It housed one of the largest natural history collections in the world, and was open to the public. In 1932 he was forced to sell the vast majority of his bird collection to the American Museum of Natural History (AMNH) after being blackmailed by a former mistress. Adolphe Boucard collected extensively in Mexico and Central America, concentrating on collecting hummingbirds. He sold scientific bird skins to Natural History museums and supplied the plume trade. In 1891 he moved to London and set up a taxidermist company Boucard, Pottier & Co. He facilitated the sale of 3 Forest Fody specimens from Rothschild to the AMNH. 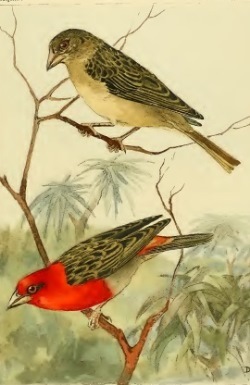 The Forest Fody was first illustrated by Delacour (1932), showing a male, after visiting Madagascar. The next illustration to be published was by Lavauden (1937), showing both male and female. Foudia omissa	Rothschild 1912a,	Bull. Brit. Orn. Cl. 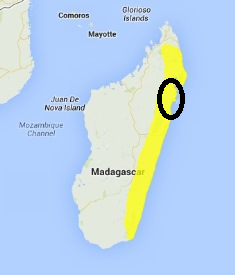 31 p.26,	Tamatave, Madagascar. omissa, Latin: omissus, negligent, remiss (i.e. previously overlooked) (omittere, to let go). Three types are in the American Museum of Natural History. Identification. 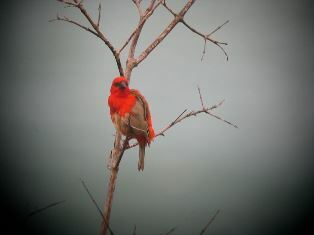 The Forest Fody male has a red head and breast with a white belly. The female is dull coloured, and non-breeding males resemble females. Moulting or immature male Madagascar Fodies may be confused with this species, but the Forest Fody has a heavier bill being deeper and longer than that of the Madagascar Fody. Distribution. 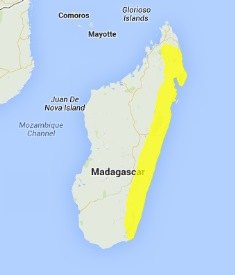 The Forest Fody occurs in forest in eastern Madagascar (see map below, based on Birds of the Malagasy region). There are no subspecies. The Madagascar Fody is found outside forest, and the Forest Fody occurs in forest, but both species overlap on forest edges (due to forest fragmentation) and hybridisation has been recorded. Habitat. The Forest Fody inhabits intact evergreen forest, from sea-level to 2000 m.
Food. The Forest Fody feeds on seeds, insects and small amounts of nectar. It forages in small flocks of up to 15 individuals, and may join mixed-species flocks. Breeding. The Forest Fody is apparently monogamous. Nesting is similar to that of the Madagascar Fody. The nest is globular with a side entrance. The eggs are pale blue, and the clutch is 2-3 eggs. There have been no breeding studies for this species.